31 Day Challenge - Day 8 - Black and White - Pandas! 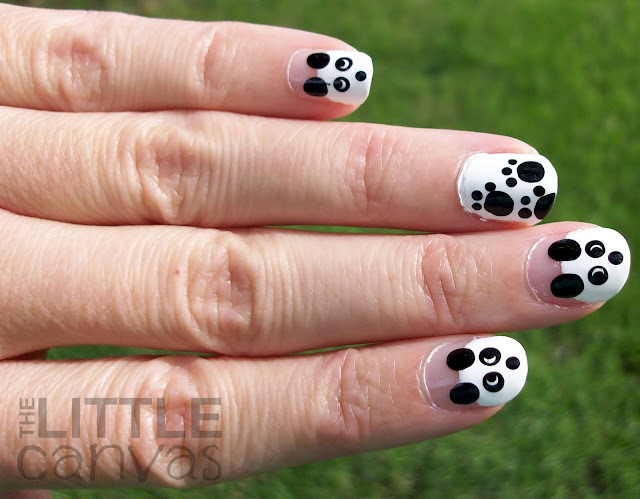 Welcome to Day 8 of 31 Inspired Days of Nail Art!!! Day 8's theme - Black and White! The two simplest colors, although, some people say that they aren't a color but instead a shade. Or maybe it's the other way around, I'm not 100% positive on that whole thing. Either way, the theme is black and white. To me, black and white can be kind of boring. Think about it, what things are black and white....dice, checker board.....meh. Okay, a checkerboard does look really cool on a nail, I've done it before, but I just was not feeling it for this challenge. So me, the crazy Alaina who is never happy with a simple manicure, got to thinking "How could I turn black and white into something less boring?" The lightbulb went off, and I realized I could do an animal manicure!!! My choices were zebras or pandas....guess which cute option won. To get these lil guys, with a paint brush, I painted arches onto the nails which were going to have panda heads. Once the arches were there, I used the bottles brush to fill in the tip of the nail from the arch. When dried, I used my dotting tool to add the ears, eyes, and nose! On the ring finger, I painted on two coats of white, and with the dotting tool added some lil paw prints! 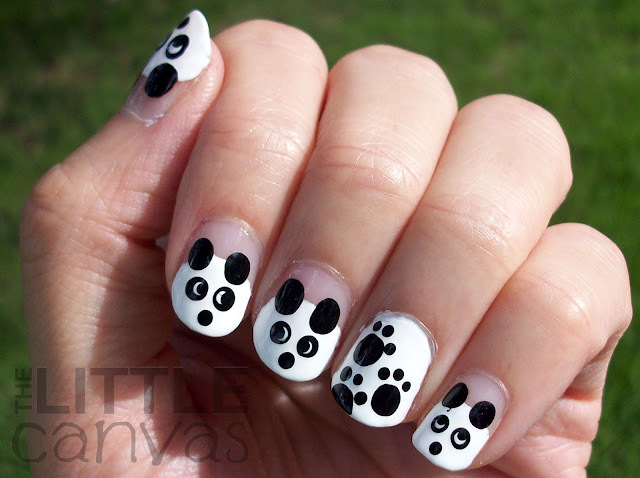 I love animal manicures. Seriously, who could hate them! 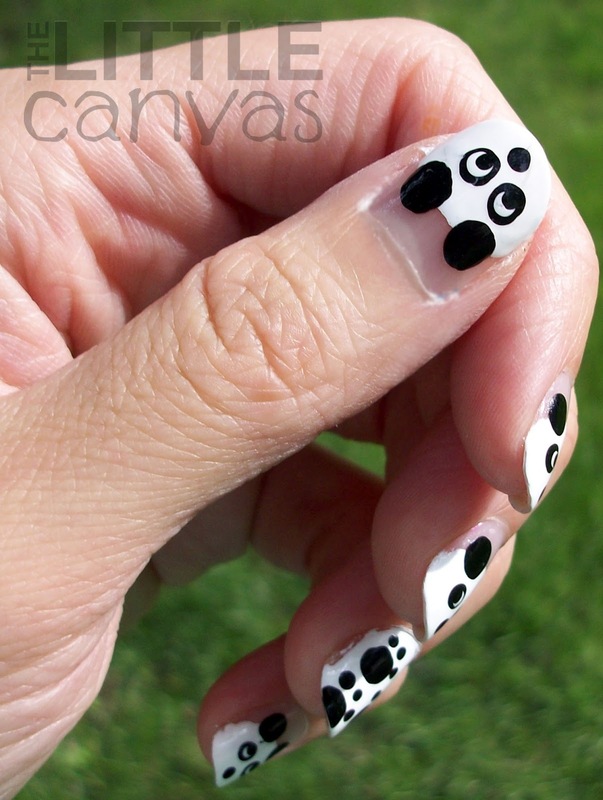 What's your favorite animal manicure? Have you ever done pandas? 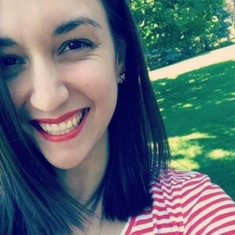 As a reminder, this is the challenge....and don't forget to check out the other lovely ladies! I think they may be my favorite manicure yet. lol thank you! I literally went 'EEP!' when I saw these. Too cute! 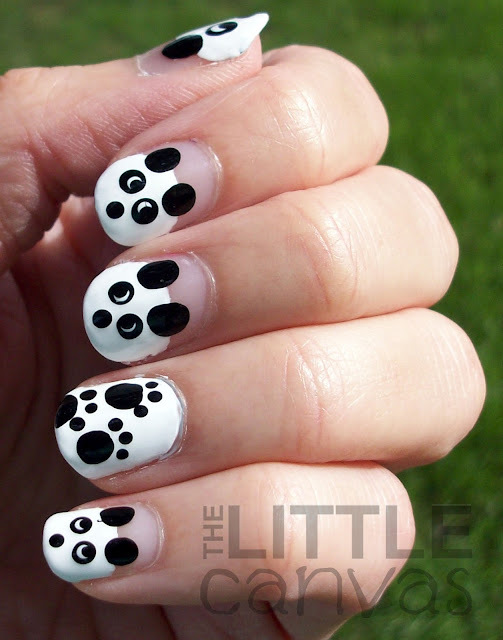 i loved this manicure.. SOOO cute.. i just have seen yours and nicole's and loved both manis..!! Super cute!! I am loving how they are like half nail loving it!! I think if I put a base on, like green or blue, I wouldn't have liked them as much! The white polish covered the yellow stain from the emoticon nails so it worked perfectly!!! hahaha thank you!! Aww these are sooo cute, very neat job! Your nails are so cute! I love that you included paw prints! I was iffy about putting them on, but am so happy i did!!!! Thank you!